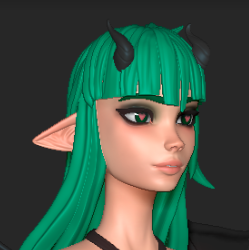 I can´t figure out why but everytime i import an FBX with animation from maya to Marmoset the geometry acts really weird and my texture doesn't look good. Heres an example, FBX left and OBJ right , as you can see even without applying the texture you can already see that it is not correct even tho is the same geometry. You can try exporting your FBX file with different settings, try making sure normals is enabled, but bi-normals and/or tangents is disabled. Are the material settings the same for both meshes? We attempt to load the material settings from the mesh, and FBX and OBJ save different data, so the materials come in a bit differently. Try adding a new material to the FBX mesh and see if that resolves the problem.